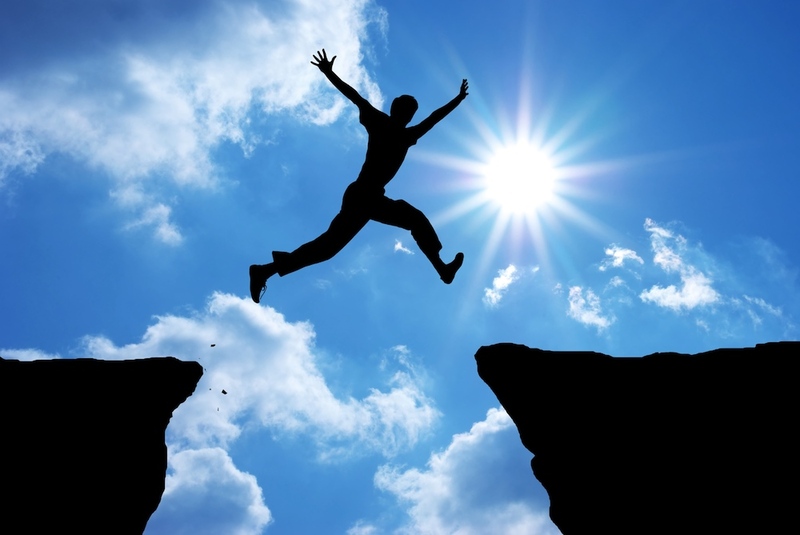 It's time to take the leap and live a more happy, conscious life! According to universal law and the science of quantum physics, everything in the universe is fundamentally made of pure energy. This energy is constantly moving, oscillating and vibrating at different speeds – fast or slow. Though we have flesh and bones, we too are essentially just energy moving at a rapid pace, and that energy has a vibrational frequency. Perhaps you’ve never thought about your frequency before, but it impacts every aspect of your life. You create your own reality, and like attracts like. By the law of attraction, you magnetize or repel all experiences, people and circumstances into your life, even ones that appear to be coincidental or accidental in nature. Similar to radio waves that are heard clearly but remain unseen, your vibrational frequency emanates from your cumulative thoughts, emotions and consciousness, and is continually being broadcast out into the universe. This broadcast then attracts similar experiences, people and opportunities, good or bad. A high oscillating vibration attracts more high frequency, spiritually uplifting, or “positive” experiences in life. A low vibration attracts the opposite. To determine your frequency, it’s simple: pay close attention to your feelings. When you hold positive thoughts in your heart and mind, you feel happy, inspired and content; when you hold negative thoughts, grouchy, angry or sad. The better you feel, the higher your frequency will be; the worse, the lower. 1. Meditate. According to countless studies, including one conducted by a Harvard Med School team led by Sara Lazar, PhD, the practice of meditation permanently strengthens the most evolved portion of the human brain – the frontal lobe – which is linked to increased abstract thought, cognitive reasoning, creativity and positivity. It also triggers the brain to release naturally occurring neurotransmitters, including dopamine, seratonin, oxytocin and endorphins, which are linked to different aspects of happiness from simple pleasure to a deep sense of calm. Regardless of your religious orientation or which method you choose to meditate, sitting still for even five minutes a day can help you clear the mind, confront and minimize negative conscious and unconscious thinking patterns and connect to the divine space within that transcends thoughts, feeling and circumstance. Over time, this practice will raise your energetic frequency and contribute to a happier, more uplifted experience of yourself, others and the world at large. 2. Unplug from the Matrix. Although computers, smart phones and ipads are great for staying connected in the information age, all electronic devices emit subtle, invisible electromagnetic fields (EMFs) that can negatively impact your energy field and drain spiritual life force. To limit your exposure, use these devices for no more than two hours at a time before taking a break. At night before going to sleep, turn off all wi-fi equipment and unplug the router to prevent interference with your circadian rhythm, which can cause you to awaken less rested. If breaking with technology even for a few hours a day seems difficult, start small with a tech detox one hour a day, then just after work hours, and eventually work yourself up to one tech-free day per week. 3. Bathe. Ever heard of people who get their best ideas in the shower? That’s because cleansing helps wash away unseen energy patterns from the body’s aura (including those picked up from others and accumulated throughout the day), making room for new creative thoughts and positive energies that are always seeking to guide us. If you’re a bather, just a twenty minute soak in healing Epsom or Celtic Sea salts can help detoxify your astral energy field, invigorate your chakras, and soothe aching muscles. Where possible, use natural, organic soap free of toxins, artificial chemicals and fragrances (which weaken the aura). In a pinch, just washing your face and hands can help freshen your perspective. For extra energy cleansing, try the Native American ritual of smudging. 4. Spend Time with Positive People. It’s been said that you become the sum of the five people you spend the most time with, so take a good look at your social circle and make sure it’s elevating, not suppressing, your vibrational frequency. Not sure if those around you are friends or frenemies? Take a look at how you feel and how you behave when you’re with them. Are you your most authentic, empowered self, or do you put on a mask that disguises or demeans who you truly are? After spending time with the friend or group in question, do you feel uplifted, empowered, and content? Or drained, angry, and depressed? Be honest, even if it means breaking with tradition and switching up your social circles. Your spiritual health depends upon it. 5. Move Your Body. In addition to anti-aging, mood and metabolic benefits, even small amounts of physical exercise can raise your vibration. Whether it’s walking, running, swimming, spinning or practicing tai chi or yoga, physical exercise can help get you out of mental or emotional ruts and boost healthy endorphins. It doesn’t matter how much you sweat; the key is moving through and away from astral energies that could be weighing you down in your current environment. If possible, exercise outside or somewhere in nature. Just noticing the trees, feeling your feet rooted in the grassy earth, and breathing in fresh air will help you transcend the concerns of mundane human existence and reconnect with your higher self. 6. Organize Your Environment. According to organizational expert Karen Kingston, author of Creating Sacred Space with Feng Shui, when a client tells her they’re sad or depressed, the first thing she asks them to do is clean out a drawer. This is because our physical environment mirrors our emotional state. Just as cleanliness is next to godliness, a cluttered home is a sure sign of a cluttered mind. Even chores as simple as taking out the trash, washing the dishes, vacuuming a room, or making your bed in the morning can have a measurable impact on your state of mind and provide an instant energy boost. 7. Serve Others. As the saying goes, you get to keep what you give away. Countless studies have shown that those who volunteer their time regularly towards worthy causes in service to others and the world are happier, healthier, and more personally fulfilled. The next time you’re feeling overwhelmed or pressed for time to accomplish all of the tasks on your ever-growing to-do list, stop by your local food bank, spiritual center or homeless shelter and pitch in for an hour or two. Just the simple act of taking the focus off of your own problems and opening up to share with others will move you into greater alignment with the natural flow and grace of the universe. 8. Clean Up Your Diet. You are what you eat. Keep your vibration high and your body strong with a diet largely consisting of fresh, organic fruits and vegetables. Regardless of how grass-fed a cow was, or how free range a chicken may have been, when you consume animal flesh, you ingest their vibration at the time of death: fear, terror, and despair. Despite their purported health benefits, even animal by-products like cheese, butter, eggs, and honey come at a vibrational price. Your consciousness will be infused with the energy with which those ingredients were extracted from the animal or hive. Even if you’re not ready to give up meat, the next time you’re feeling blue, try this experiment: abstain from animal products and eat nothing but minimally processed, live foods and juices. See how you feel – the result may surprise you. 9. Go on a News Detox. Ever feel depressed, anxious or fearful after watching or reading the news? This is because most mainstream news outlets serve a primary purpose: earning profits. The quickest way to make a profit is by appealing to the lowest human common denominators of fear, greed, and violence. As merchants of chaos, the mantra of “if it bleeds it leads” dictates what is, or is not newsworthy. As a result, a number of spiritual traditions recommend that seekers aspiring to higher states of consciousness refrain from reading and watching the news. Try it for a week and see how you feel. 10. Practice Gratitude. In his bestselling book, The Hidden Messages in Water, internationally renowned Japanese scientist Dr. Masaru Emoto used high-speed photography to demonstrate how profoundly our thoughts, words, and feelings impact molecules of water, the earth, and our personal health. He found that water from clear springs and water that had been exposed to loving words – like “thank you” showed brilliantly colorful, complex, and multifaceted snowflake patterns. By contrast, polluted water and water exposed to negative thoughts formed incomplete, asymmetrical patterns with dull colors. Imagine the effect saying thank you can have on our bodies, which are composed of over 70% water? To tap into the gratitude frequency, practice saying thank you to people in your life more regularly, and keep a daily gratitude journal listing everything you appreciate about yourself, your life and the world. Bianca is the Creative Director and host of Conscious Living TV. A graduate of Princeton University and The University of Virginia Law school, after a successful career as a Hollywood entertainment attorney at Paramount and later on-camera talent for hit U.S. TV shows on Lifetime, TV Guide and TV One, in 2006 Bianca combined her passion for media, health and sustainability to launch Conscious Living TV with her husband and business partner Michael. She won an EMMY© for her role as “Outstanding On-Camera Correspondent” on Conscious Living TV’s original series, Soul of Green, a news program about urban health and sustainability. A passionate wellness advocate, Bianca is a certified yoga instructor, 2nd degree Reiki master, eco-artist and certified raw food and plant-based nutritionist. From daily meditation and wearing ethical fashion to following a vegan diet and documenting healing travel around the world, she’s committed to the life-long journey of mindful living – one day at a time. In addition to her work on Conscious Living, Bianca has contributed to The Huffington Post and ReWire Me, and currently serves as a lifestyle contributor for Spirituality & Health Magazine. Bianca is also an award-winning fellow of the U.S.-based Association of Health Care Journalists.